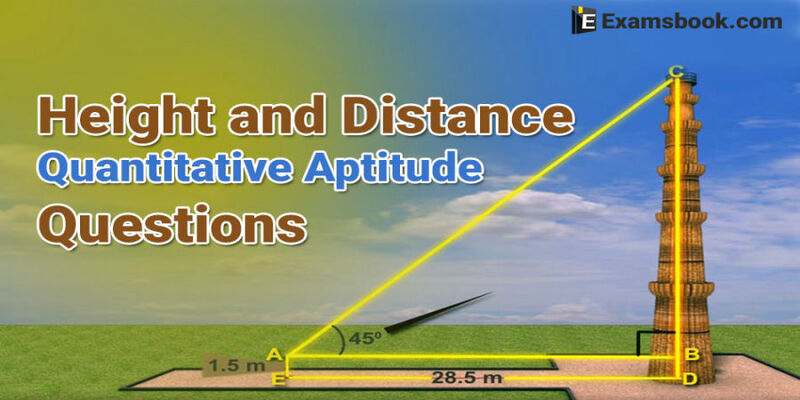 Height and Distance Questions asked in many competitive exams and Height and Distance problems are also important for SSC and Bank exams point of view. Here I am sharing important Height and Distance Questions and answers to practice for the competitive exam. Try to solve yourself Height and Distance Questions for better practice. You practice height and distance formulas with examples and also try to solve height and distance questions in Hindi. Q.1. A man is watching from the top of a tower a boat speeding away from the tower. The boat makes an angle of depression of 450 with the man’s eye when at a distance of 60 metres from the tower. After 5 seconds, the angle of depression becomes 300. What is the approximate speed of the boat, assuming that it is running in still water? Q.2. The top of a 15-meter-high tower makes an angle of elevation of 600 with the bottom of an electric pole and angle of elevation of 30 with the top of the pole. What is the height of the electric pole? Ask me in the comment section if you face problem while solving Height and Distance Questions. Share with friends if you found it helpful.Visit on the next page for more practice.